Emily from The Lacquerologist published a BOOK! That is just so awesome and I couldn’t be happier for my fellow blogging friend! I received a copy of Idiot’s Guides: Nail Art to review and share with you all today because it’s full of nail art tutorials! With over 75 tutorials and categorized by difficulty level, there is something for everyone to try. Emily is a nail technician at her own nail spa so there are also really informative pages about nail care, polishing, gel polish, nail art basics and more. I’ve followed one of my favorite tutorials from the book as well, so let’s take a look! The book has beautiful photography and the cover is gorgeous! As soon as I saw it, I knew the IKAT design on the cover would be the one I had to recreate first! As I said above, before the book gets into the tutorials, there are very informative sections about nail art basics: the natural nail structure, manicure products, nail art tools, manicuring basics, polishing basics, good nail habits, product ingredients, gel manicures, 3D elements used in nail art, how to remove polish, pedicures and incorporating nail art onto toenails, and combining techniques. I learned a lot in these sections so don’t skip ahead to the tutorials when you get the book. Here are some sneak peek photos of the inside of the book. I didn’t want to show too many pages because I want there to be some surprises if you purchase it! Something I learned when I started really getting into nail art was the easiest way to polish my nails without making a crazy mess. Emily outlines step by step the same technique I follow as well. The nail art tutorials are split into 3 different categories. There are 30 that fall into the “Simple Designs” section. There are 28 tutorials that fall into the “Intermediate Designs” section. There are 19 designs in the “Advanced Designs” category. When flipping through the book, I found over 55 design ideas that I’ve never done in the 4 years I have been doing nail art. So even as a seasoned nail artist, I am really happy to have this book! The tutorials are explained very clearly with photos showing the step by step process. Most of the tutorials are only 6 steps each. Some of the more intricate are 9 steps, with 2 designs at 12 steps. There are only a few simple tools needed for each design as well! The first tutorial I tried is the IKAT design from the front cover. This falls into the “Intermediate Designs” category. I followed Emily’s instructions and I am happy with the results of my IKAT nails! I added a 4th color to my design, but aside from that I did everything in the tutorial! I was really happy with the simple, clear instructions for this design that I had never tried before. My base is Dior Saint Tropez. I used OPI Alpine Snow and Black Onyx for the black and white layers. Orly Frolic was the pop of color added in the last step before top coat. Another thing I loved about Idiot’s Guides: Nail Art was that each tutorial page was the same clean layout. The full hand design photos are on the left side so you can flip through holding the book as I show in the photo below to see all of the designs for easy picking. Even Mr. Adventures In Acetone commented on that when we were looking through it. And another little side note, there is an awesome Resources section in the back of the book and Adventures In Acetone is a named blog for nail art and step by step tutorials!!!! That is just so majorly exciting for me and I am so thankful to be included in the list of places to go for more nail art. 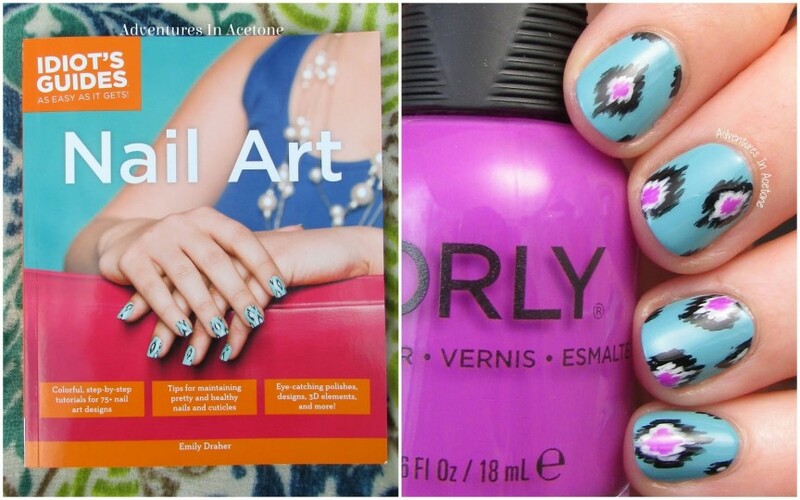 What do you think of Idiot’s Guides: Nail Art? After I finish writing this post, I’m going to follow another book tutorial for a holiday nail art look I plan to wear this week. I’m sure you will be seeing tons of designs from the book on my nails in the new year as well. My thoughts? I am really impressed with this book. I’ve never had a nail art book before so I wasn’t sure if it would be helpful to someone like me that has been doing nail art for years. But honestly, I am so excited to try a lot of these! The clear photos, step by step instructions, and simple tools make this a winning book! There are designs for tons of holidays and occasions, or just everyday nails. The informative pages were really helpful as well. Whether you are a beginner, someone who has been doing nail art for a while, or even want to buy this for someone who has shown interest in nail art, this would be a great purchase! Idiot’s Guides: Nail Art is available for preorder on Amazon right now for $13.09 (list price of $16.95) with a release date of January 6th, 2015. (Actually, I just checked and it’s showing “temporarily out of stock” and you can add to the cart and will be charged when it is shipped.) It is also available in a Kindle edition for $8.99. *The book in this post was sent for me to review with my honest opinion. *There are affiliate links in this post, so I will receive compensation if you click through and purchase. This looks like a fantastic book! I cannot wait to get it! I love her blog and I plan on getting this book. I am even more motivated to do so after reading your review of it! Wow, you are in the book too! That's quite an honor. Ooh, this looks handy! I've missed so much in my absence! Congrats to her on her book and that's wonderful you were mentioned! Definitely putting this on my wish list! 🙂 I love that it so clean, well designed and LOVE that it includes nail care information as well!